This is the first time i have went to the internet to get some help with trying to make my 4.5 yr old better. For the past 2 weeks my whole household has been very sick, with a horrible congested cough and sneezing and a run down feeling. My husband has gotten better as well as I have. Of course with my son, i took him to the doctor to see what was going on. They said he had an upper respiratory infection and placed him on a steroid (WOW) made him climb the walls ! and of course an antibiotic, well that will be 2 weeks ago tuesday, he was getting better not coughing so much and or sneezing. Well he came home from his dads and i noticed his cough was deep again, and he was sneezing yet again. So i am going this morning to get 2 vaporizer and some sea salt, lemon and honey. i would get rum but those stores are closed on sunday. if you have anything else i can do to help my son please let me know. Thank You so Much !!!! 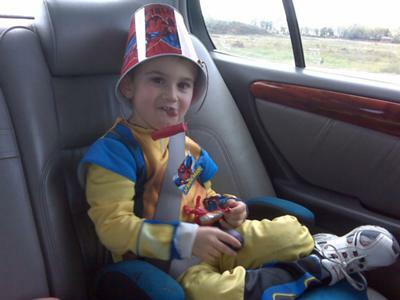 Thank you so much for sharing a photo of your little character, I got a kick out of seeing him with that bucket on his head, it reminded me of my one son at that age. I have to admit, I had to gasp when I read the Dr. put this little guy on steroids. Please believe me, I'm not judging you as a parent, we all do what we feel is best for our children, especially when they are so young, we tend to worry more about them than ourselves. I do get upset with the medical profession and how they don't hesitate to put children on antibiotics and steroids. First of all, I'm flattered that you never really turned to the internet for advice on health care issues and you found my website first. Second, I'm really flattered that you would trust in my home remedy for respiratory infections. I have used this home remedy for all my children whenever they came down with a cough and cold. I'm glad to know that you went to get what you needed, especially a good vaporizer, when I read you had the sense to buy two I was really impressed. This way you'll have one for his bedroom and when he's out of his room. The only other thing I would advise is to make some nose drops for your little guy. Start with about a cup of cold tap water and add a 1/2 teaspoon of sea salt and let it come to a boil. Let it cool to room temperature and put it in a container and drop a few drops in each nostril. If he was older I'd suggest a neti pot but not at his age. You might consider getting a neti pot and keep it on hand for yourself when you get the sniffles again. The next thing you might want to consider is getting some fresh garlic and making your little one a garlic sandwich. I know that might sound yucky but it's actually pretty good. I gave this to all my children as soon as I suspected they had a fever or cold coming on. It's gotten to be a joke around our house. Just take a piece of bread and spread some butter on it and sprinkle some fresh chopped garlic over the butter, fold the slice in half and let them eat it down. Do this a couple time a day. Fresh garlic is a natural antibiotic that will knock that infection out. Once the son of a friend of mine was put into a hospital due to high fever. He was only about 6 years old. The Dr. told her that he was lost because he tried different antibiotics and nothing would bring his fever down. I took a garlic and butter sandwich into the hospital and got him to eat it, within two hours his fever broke. The Dr. couldn't believe it. PS Give little Buckethead a hug from his cyber Grandma.